The Villages at Two Rivers is a 55+ community in Odenton, Maryland. This active adult community will consist of about 800 homes on 1,468 acres of lush landscapes and open natural spaces. The Villages at Two Rivers offers luxurious attached villas and single-family homes in a variety of home styles designed by various builders for the active adult homebuyer. Centrally located near Washington D.C. and Baltimore, homeowners will have plenty of dining, recreation, and shopping options as well as easy access to Highway 3. Active adults in The Villages at Two Rivers have great amenities at their 15,000 square-foot clubhouse, Founders Club. It is the central hub of physical and social activity in this 55+ community. The lavish clubhouse features a fitness center, multi-purpose room, meeting room, indoor and outdoor pools, tennis courts, and walking trails. Residents also enjoy the beautiful outdoor grounds of the clubhouse that has a nature center, gazebo, garden, event lawn, picnic area, and scenic ponds. Multiple builders began construction in The Villages at Two Rivers in early 2015 and plans to build 800 attached and single-family homes. These luxurious homes are designed with unique exteriors and provide elegant and functional living spaces. Homebuyers can choose from a variety of open floor plans with master suites on the main level. Attached villas by Classic Group offer 1,614 to 1,803 square feet of living space. They have two bedrooms, two or two-and-a-half bathrooms, and an attached one-car garage. These homes feature second floors with plenty of attic or loft space. Comstock Homes offers attached villas that range in size from 2,050 to 2,346 square feet of living space. They have three or four bedrooms, two-and-a-half or three-and-a-half bathrooms, and an attached two-car garage. Homeowners can personalize their home with additional bedrooms or bathrooms in the basement. Attached homes by Winchester Homes offer 2,226 square feet to 2,993 square feet of living space. They have two to four bedrooms, two-and-a-half to four bathrooms, and attached two-car garages. Ryan Homes offers five floor plans ranging from 1,407 to 2,242 square feet of living space. These single-family homes have three or four bedrooms, two to four bathrooms, and an attached two or three-car garage. Homebuyers can choose to finish second-floor living spaces and basements for additional bedrooms or bathrooms. Single-family homes by NV Homes offer 2,016 to 2,582 square feet of living space. All models have at least three bedrooms, two to four bathrooms, and an attached two-car garage. Home styles include spacious living areas, granite countertops, hardwood floors, large master suites, and energy efficient designs. Buyers can also customize their home with optional bedrooms, bathrooms, bonus rooms, or dens. Homeowners will be able to enjoy social gatherings and build friendships with neighbors in The Villages at Two Rivers. As the community continues to develop, active adults can get together to socialize in the upcoming clubhouse or start a club based on similar interests or hobbies. Residents have more time to do fun things because homes in The Bluffs at Two Rivers are maintenance-free. They can leave the exterior-home maintenance chores to the homeowners' association, which includes lawn maintenance, trash and snow removal. The Villages at Two Rivers is located in Anne Arundel County, Maryland. Active adults living in this 55+ community have access to Waugh Chapel Towne Center, which offers a selection of shops and restaurants. Off of Highway 3, residents can choose from a wide variety of attractions like golf courses, hospitals, and entertainment attractions. They can also visit the beautiful Patuxent River Park which is located next to the community that offers plenty of outdoor space for activities like hiking, fishing, canoeing, and jogging. For big city fun, homeowners can drive to Baltimore or Annapolis, both of which are less than 45 minutes away. Residents who want to visit our nation s capital can drive to Washington D.C. that s only 29 miles away. 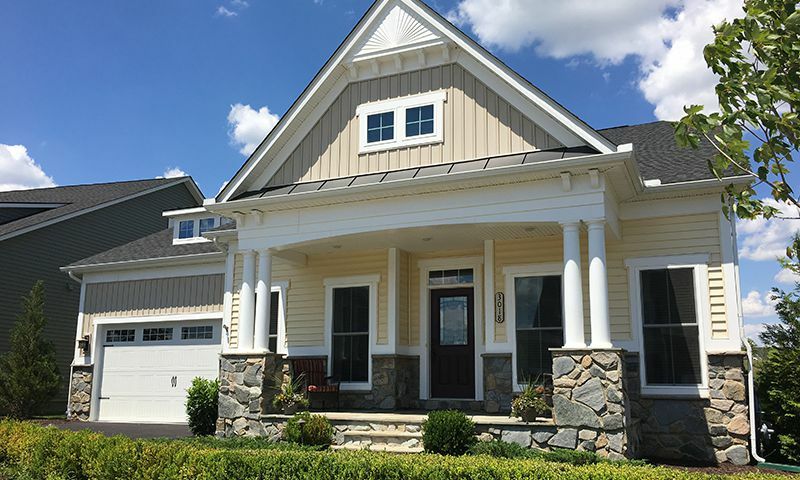 The Villages at Two Rivers has everything active adults want or need in a 55+ community in Odenton, Maryland. Founders Club - 15,000 Sq. Ft. Check back soon for more information on the lifestyle in The Villages at Two Rivers. NV Homes features luxurious single-family homes offering 2,016 to 2,582 square feet of living space. They have at least three bedrooms, two to four bathrooms, and an attached two-car garage. Home styles include spacious living areas, granite countertops, hardwood floors, large master suites, and energy-efficient designs. Buyers can also customize their home with optional bedrooms, bathrooms, bonus rooms, or dens. Two Rivers is a very active, social community with an incredible bound between the residents. They get together Friday nights in the clubhouse for luau, or St. Patrick's Day parties, Superbowl Chill Cook-Offs, cards, pickle ball and walking club. There are Zumba classes, water aerobics, and the Washington, Baltimore, Annapolis hike/bike trail goes right through the community which is a great trail! So much to see and do! And with a great HOA to take care of the lawn and snow removal, there is more time for hikes, and get togethers with friends! 55places.com is not affiliated with the developer(s) or homeowners association of The Villages at Two Rivers. The information you submit is distributed to a 55places.com Partner Agent, who is a licensed real estate agent. The information regarding The Villages at Two Rivers has not been verified or approved by the developer or homeowners association. Please verify all information prior to purchasing. 55places.com is not responsible for any errors regarding the information displayed on this website.